Making drinks in an old garage listening to reggae all day. Beyond the corporate benchmarks to management within highly influential indie restaurant groups like Hillstone, Innovative Dining, and New York Restaurant Services Danielle and Allan continually sought to learn from the best. Thusly, they worked under leaders of the cocktail renaissance like Dale Degroff, Tony Abou-Ganim, Julie Reiner, and Sam Ross. It was opening Tony’s Bar Milano in NYC where they met and discovered the chemistry that would forever change their careers. 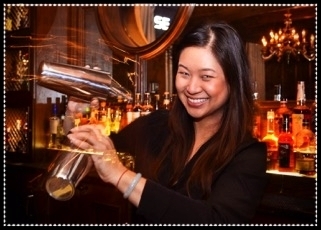 Recently they have spent the last five years running Caña, which many aficionados hailed as L.A.’s best cocktail bar under their tenure. Caña was a labor of love Allan and Danielle treated as their own – Each year represented one of five “qualifying laps.” Having far exceeded their own growth expectations for the members’ bar, they’ve packed their lessons learned and are going public again.